In the odo sketches below (from Odopod) you can see similar techniques used digitally as we use when creating artworks in oil pastel, such as layering, blending, and using muted and vivid colours for shadow and light. Below is an example of what a finished draft design of a monster or mythical creature might look like. On the left, you can see the planning stages of morphing two vastly different creatures together. 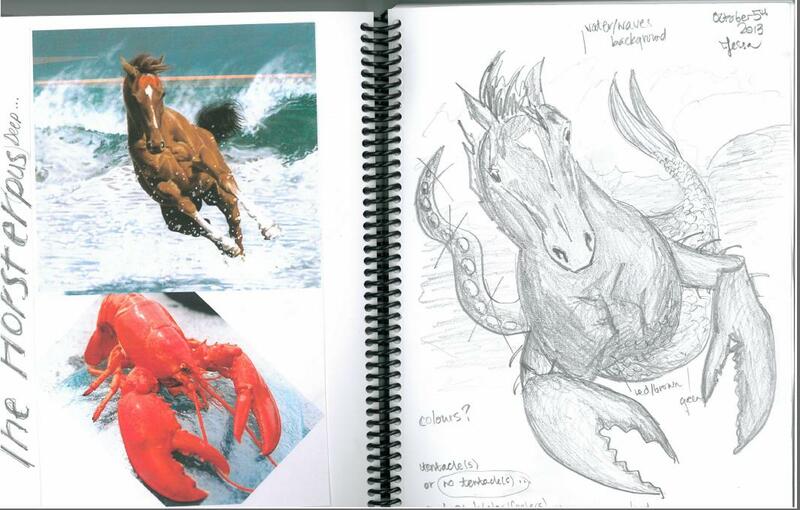 On the right, we get a recreated version of lobster and horse, the Horster of the Deep. In the plan of the draft, you can see that the artist tried out different ideas, such as a tentacle, but changed their mind. They also jotted down ideas for the background based on the hero-myth created for the creature. There are ideas of a colour scheme, ready to be tested out in pastel.